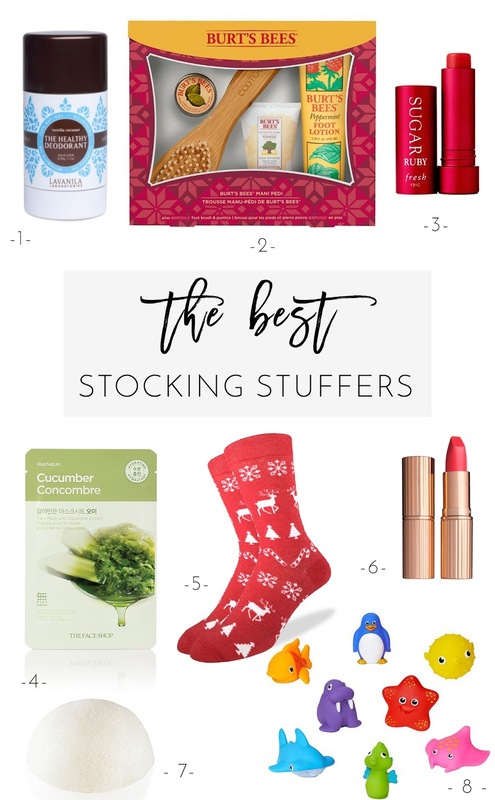 I'm back with what might very well be the last gift guide for the 2016 Holidays: stocking stuffers! Besides the basics (funny little knickknacks that we find over the course of the year and the person's favorite chocolate), my husband and I like to buy some really funny items for my stepdaughters. We go to novelty stores that sell imported candy and have a lot of fun buying strange looking, weird flavored goodies. We also like to stuff their stockings with a lot of cosmetics and other beauty related items. As for our 2 year old son, toy cars, small books and bath toys make the best stocking stuffers. Here are some fun suggestions for just about everyone. -1- I've mentioned my favorite deodorant here and here. (Why yes, I had forgotten I included it in my stocking stuffers last year - I love it that much) It's fancy and perfect for a Christmas stocking! -2- This cute mani / pedi set has everything you need to pamper yourself at home. -3- A luxurious tinted lipbalm is something I wouldn't buy for myself, which makes it the perfect stocking stuffer for yourself, your mama, sister or daughter. -4- Face masks are always fun! I've enjoyed face masks with my stepdaughters, husband, brother, sometimes even all of us together. -5- I mentioned the Good Luck socks subscription as a big time present here. You can also get individual pairs of socks with the coolest designs as stocking stuffers for the whole family! -6- Again, a fabulous lipstick on the expensive side is not something I splurge on everyday. I love the Charlotte Tilbury Matte Revolution lipstick in Lost Cherry. -7- This odd little thing is a Konjac sponge that cleanses your face thoroughly while being super gentle. It is the coolest thing and I've been swearing by it! For $5, it is a stocking must-have! -8- Bath toys are the coolest for children under 6. Munchkin is my personal favorite with their huge, colorful and creative selection.